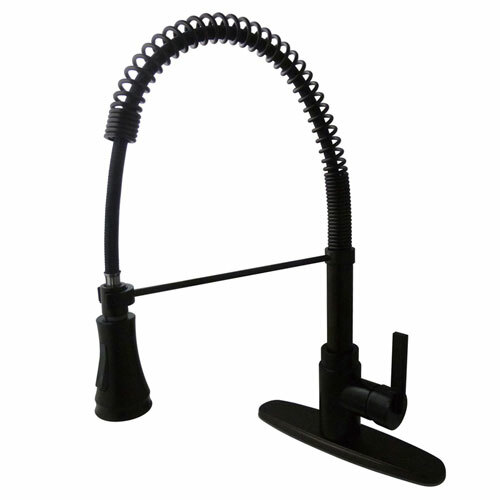 Kingston Oil Rubbed Bronze Single Handle Pre-rinse Kitchen Faucet GS8875CTL: This Single Handle Pre-rinse Kitchen Faucet is built to last. The highest quality standards are used to precision manufacturer a top of the line product. Important features of this BRAND NEW Fixture: Complete Item! Everything necessary for installation is included. - Solid Metal Lever Handle - Matching Accessories Available - Easy to Install - Installation instructions included - Single Handle Pre-rinse Kitchen Faucet - High Quality Brass Construction - Commercial Style Pre-rinse Sprayer spout - Stylish Single Lever Handle - Optional Deck Plate - Spout Height: 19 3/4-inch - Spout Reach: 8 3/4-inch - Oil Rubbed Bronze premier finish designed to resist fading and tarnishing. This fixture is manufactured by Kingston Brass and is part of their precision Designed Plumbing Fixture collection.